Buy tortillas? If you want restaurant-caliber tacos, then you should really consider making your own tortillas. It is not as difficult as you might think, and the quality is absolutely worth it. It is only in the last generation or two that industrially-produced tortillas have replaced tortillas hecho a mano (hand made) that grandmothers in the Southwest use to make on a daily basis. I love the flavor and texture of a good soft flour tortilla taco, personally. But one can readily make both flour and corn tortillas at home. In a medium mixing bowl, whisk together flour and salt. Using your fingers, rub the lard in the flour, coating each piece and then breaking them into smaller pieces. Repeat until the mixture is loose and crumbly and resembles coarse meal. Add the water a little at a time, mixing by hand until a rough, shaggy dough forms. Remove the dough from the bowl and move to a flat, floured surface. Knead the dough until it forms a smooth, elastic ball. Allow the dough to rest for 20-30 minutes. Heat a skillet or griddle over medium heat. On a floured surface and using a floured rolling pin, roll out a ball of dough into a circle approximately 6-inches in diameter. Cook the tortilla on the skillet or griddle until brown spots form (approximately 30-60 secs). Turn the tortilla over and cook until brown spots form on the other side (approximately 30-60 secs). 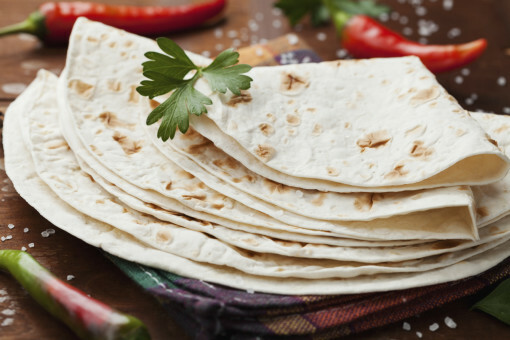 Store cooked tortillas in a clean kitchen towel to keep warm. Repeat until all dough has been used. Note: There are only four ingredients in this recipe, so quality matters. You can substitute shortening for lard, but lard is traditional, and flavor matters.